Zest the lemon and then cut it in two and squeeze all the juice from it. Place the stock, lemon zest, bay leaves, peppercorns and sprigs of dill into a saucepan and bring the liquid to a simmer. 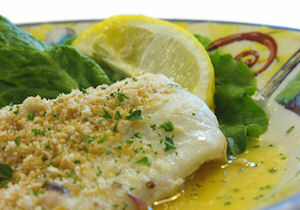 Place the haddock fillets into the liquor and cook them for around 8 minutes or until flaking and tender. Drain the stock and reserve 150ml of it. Mix the lemon juice and the arrowroot in a saucepan, stirring all the time until combined and thickened. Add the stock in to the mixture, very slowly, stirring all the time until smooth and thickened. Whisk the egg in a jug and then pour it into the sauce mixture very slowly, whisking constantly for around 4 minutes to prevent the egg from curdling. Once thickened, pour the sauce over the fish fillets.